Like kids at summer camp and even some college students, the National Zoo’s tiger cubs had to take a swim reliability test on Wednesday morning to prove they’re fit to go on exhibit. And the results are in: They passed! 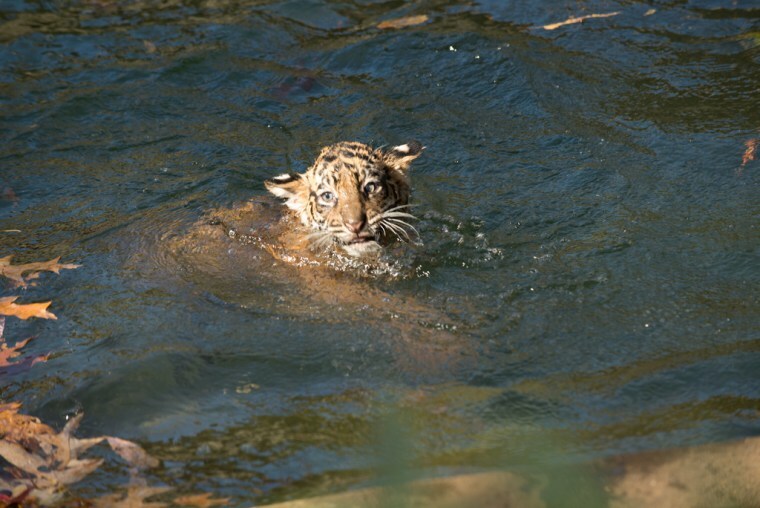 Rare Sumatran tiger cubs Bandar and Sukacita managed to keep their heads above water during the exam, paddling to the shallow end of the moat before climbing back onto land. At just over 3 months old, they will soon be free to explore their exhibit space with mom, 4-year-old Damai, who gave birth at the zoo on Aug. 5. During the exam, animal keepers Dell Guglielmo and Marie Magnuson navigated the cubs through 2 and a half feet of water until they reached the other side. Though they successfully made it across, the cubs aren't free to roam around the exhibit just yet. Starting Nov. 18, animal keepers will decide whether they are able to play in the yard on a day-to-day basis as the cubs get used to the great outdoors. Bandar and Sukacita are the first tiger cubs born at the zoo since 2006. The birth was a rare one: there are only 65 Sumatran tigers living in North American zoos and an estimated 400 to 500 left in the wild, according to the zoo. “These cubs represent hope for their critically endangered species’ future, so we need to take every precaution to ensure their survival,” Saffoe added in the statement. Can't get enough of the cubs? Check out the zoo's tigercam. Speaking of fun with tiger cubs, a young boy in a tiger costume had one fooled into thinking he was the cub's new feline friend. Two-year-old Marshall Shaffer and a tiger cub at the Point Defiance Zoo and Aquarium in Tacoma, Wash., ran back and forth on the other side of the glass. Adorableness ensued.